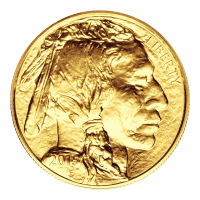 Buy 1 oz Random Year Buffalo Gold Coins | ?? These pre-owned coins may show signs of visible handling or be scratched. Weight and purity are guaranteed, but condition may vary. 1盎司随机年水牛金币 These coins are the first 9999 fine (24K) gold coins struck by the United States Mint. With a face value of $50 and a design replicated from the 1913-1938 Indian Head 5 cent coin, these pieces are sure to please. These pre-owned coins may show signs of visible handling or be scratched. Weight and purity are guaranteed, but condition may vary.